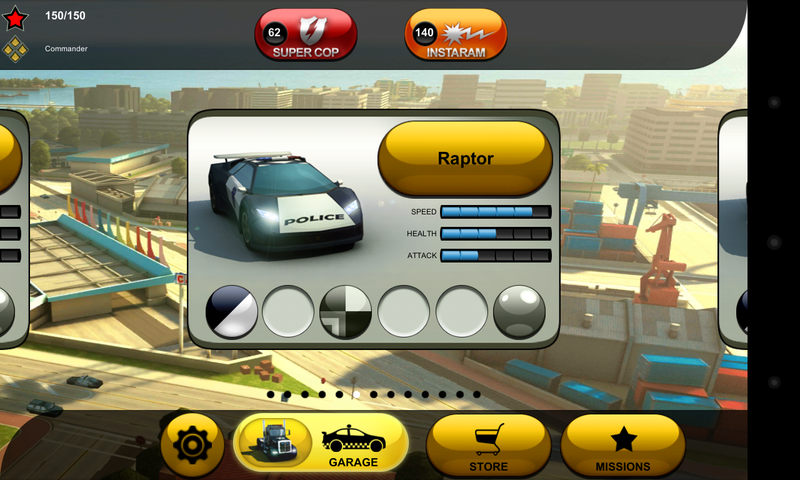 Succinct and factual contextual opener: Smash Cops Heat (iOS | Android) is the free-to-play incarnation of the original Smash Cops (iOS only) by Hutch. 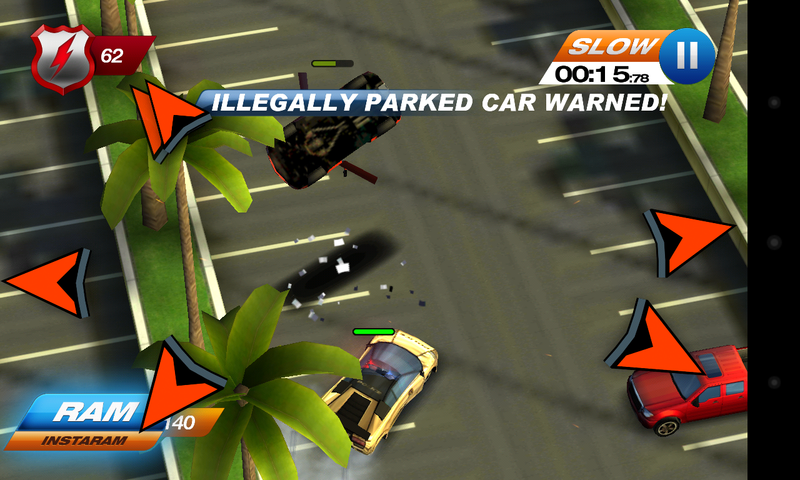 The game involves chasing down criminal vehicles and “arresting” them (or as below, cautioning illegally parked cars) by repeatedly ramming them until they blow up. So, the theme is clearly compelling. 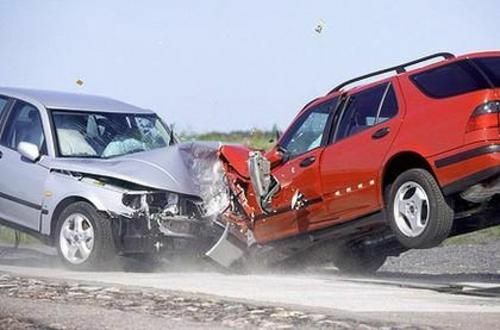 In terms of controls, there’s something rather innovative happening: wherever you put your thumb on the screen, your vehicle will try to drive away from it. This leaves your other thumb free to hit the RAM button which will give you a brief burst of speed, which, if you were so moved, you could use to smash into another vehicle to assist with an arrest. And this turns out to be rather brilliant, with a nice learning curve and the potential to develop a lot of skill. On top of all that, the game is free. Free! But of course at this point, even if you’ve bought into the above, this freeness does mean some alarm bells start ringing. The criticism levelled at many free-to-play skill games is that as you progress, they try to slowly turn into a ‘pay to win’ game without you noticingby ramping up the difficulty to the point where paid power-ups are the only way to progress. In theory, Smash Cops Heat is doing exactly this. It does offer you things you can buy to make it a little easier, and ramps up the difficulty with periodic gates to new content. But it’s actually fine. I’ll explain why I think it’s fine later, but first, here’s how the paying bit works. That RAM button takes a little while to recharge, but at the start of the game you are given a small number of ‘Instarams’, which you use by hitting the RAM button while it is in a recharging state (which is therefore very tempting to do). 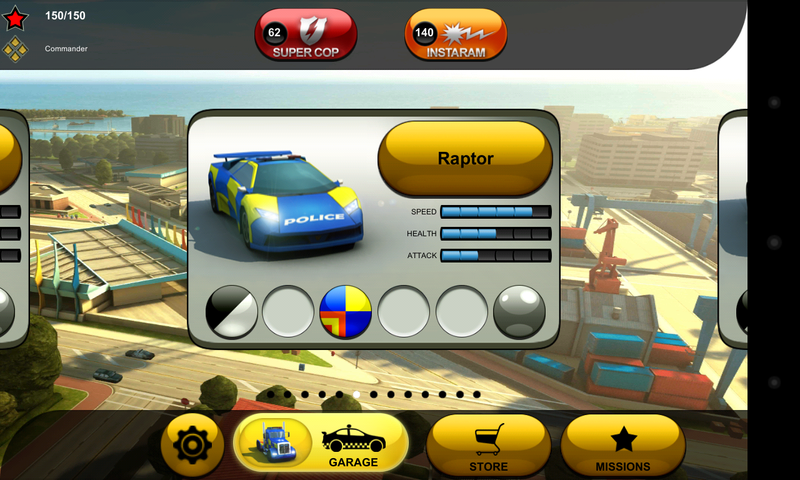 You’re also given some ‘SuperCops’, deployed by hitting another button, that will make your vehicle practically invincible and a little faster for a short time. Once per day you are given 4 Instarams and 2 Supercops, and you can of course also buy these power-ups in much larger quantities. So, the scene is set for ‘buy to win’. When you complete each level you get a star rating out of 5. Later groups of levels are only unlocked when you achieve a certain cumulative total number of stars. 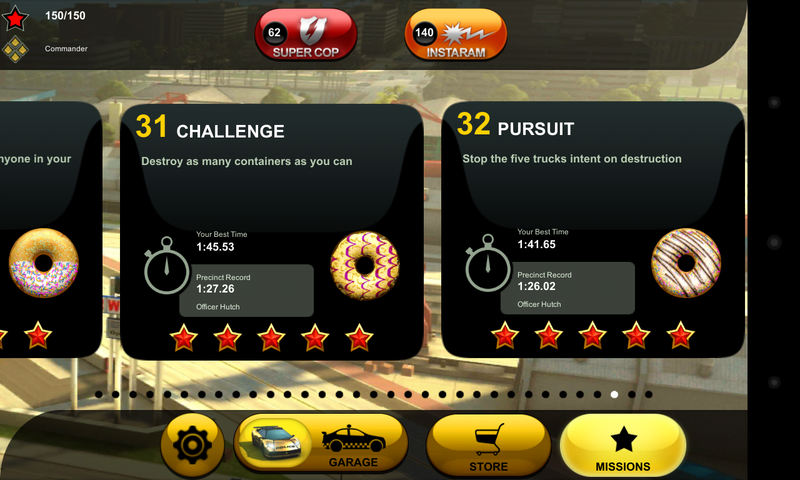 But more compellingly, better vehicles are unlocked for achieving certain (different) numbers of stars. Therefore, if you’re a few stars shy of unlocking a new vehicle, maybe you want to use some Instarams and Supercops to get there, and then the new, better vehicle will let you achieve more stars – and so unlock more levels. Despite the above, what really matters is just how difficult the levels get (against your own skill at the game), and just how many Instarams and Supercops you need, given that you get a small number for free each day. To their credit, Hutch have actively been updating and optimising the game: the difficulty curve is pretty smooth (at least for the first 2/3 of the game), and the duration of Supercops and power of Instrams was even increased by around 50% in an update that came mid-way through my playthrough. As such, with some effort, I was ultimately able to achieve the maximum star rating for all the levels, without paying for any additional power-ups. The game is therefore definitely not buy-to-win – it’s at least possible, albeit not easy, to do everything without paying. Gold Chrome police Ferrari. If you’re going to arrest people by ramming them until they blow up, this is the best way to do it. Progress all the way up to ~119 stars (out of a total of 30 levels x 5 stars = 150) was steady and smooth, with no need for Instrams or Supercops – so I ended up accruing quite a few due to the daily allowance of these. 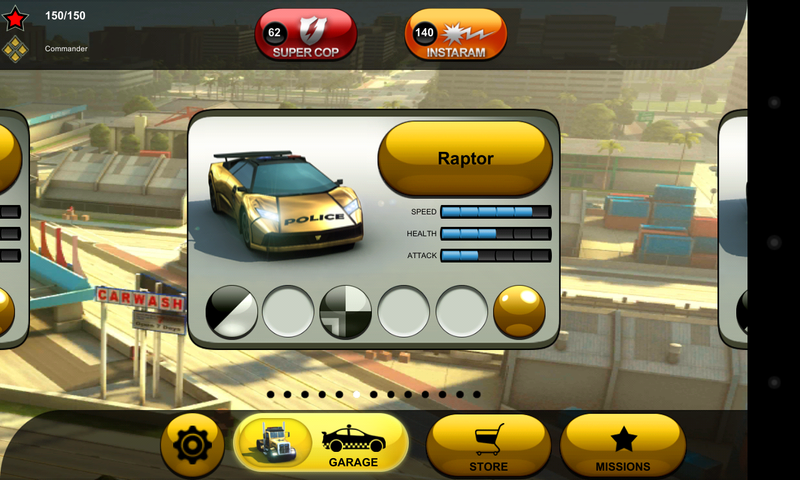 The Guardian vehicle enables you to relatively easily ‘complete’ the game, getting at least 1 star on each level. At that point, the game points out you should really try to get 5 stars on every level. If you want to achieve this, you’ll find the difficulty level escalates again, requiring many more Instarams and Supercops (pretty much the entire supply I’d built up to this point), a lot of route learning, and a deeper understanding of exactly how the game calculates damage. As I said, I got by using only the Instarams and Supercops given for free once a day. Someone less patient than me might prefer to buy them – my complete playthrough took about 2 months playing a little each day, and I practiced some of the later levels extensively to find out the smallest number of power-ups possible. Alternatively, someone more skilled than me might need fewer of these power-ups to begin with! (I’ve now posted a guide to getting all 150 stars here). This was no ordinary game. This was Urban Nightmare, a Megagame with 30 odd players representing 8 key organisations, simulating a realistic official response to a zombie outbreak over 6 hours, representing 3 days of time in the game. It was intense, challenging, and eye-opening in so many ways. At the time of writing, another run of this game is planned for Leeds on Saturday 17th November 2012 – you can read about it and sign up here (although you’ll need to do so pretty quickly). I’ll give an overview of what Megagames are, and write up my experience of Urban Nightmare below – keeping spoilers to a minimum. The strapline of the Megagame Makers website calls them ‘multi-team multi-player wargames’. The closest similar game I’ve seen is Diplomacy, but megagames investigate the mechanics of conflict and co-operation at a much deeper level. They are large (20-50 players), and long (lasting one or two days). I first came across the idea through a friend-of-a-friend, who described a megagame he’d designed to recreate the key factions and power mechanics of a certain period of Anglo-French history. He was particularly excited that at one point some players tried to stage a coup, but it failed – and this was exactly what happened in the actual historical period! Obviously, I found that idea very exciting. Megagames explore a whole area of gameplay I’ve never seen before: a very large number of players making a lot of tactical and strategic decisions, over a long period of time. It seems like a way to gain genuine understanding of how organisations and society work. If a historically accurate failed coup can naturally arise with the right starting conditions and game mechanics, this seems like a genuinely powerful way to simulate and understand such systems. Unsurprisingly, this is not a new idea: it’s part of the spectrum of military simulations which have been tried in one form or another for as long as humans have been making war. You feel like you’re part of momentous events, in a way that smaller scale games with momentous event themes (like Pandemic) can’t achieve. How is Urban Nightmare different? This particular Megagame, being concerned with a zombie outbreak, does not in fact directly reflect an actual historical event. The designer, Jim Wallman, observed that in most zombie fiction, the focus is on individuals, and the government seems largely useless – until towards the end, when the military usually comes in. He wanted to know: how does that happen exactly? Brilliantly, he used as a starting point a megagame he’d made earlier that dealt with a similar issue (in terms of official response to an unexpectedly large scale civic problem), although I won’t reveal what it is because I think it’s best for players to be as unprepared as possible. However, there were quite a few key changes, and the version I attended (Saturday 17th March 2012) was the first time it had been run. Players could select from one of the following teams: the City Police, State Police or National Guard; the Emergency Services, City Hall (Democrat) or State Governor’s Office (Republican); The Press, or an intriguing corporation with a major research office in the city called Necrotech. There was also a fairly large Control team, who ensure the smooth running of the game. Brilliantly, through a mix of self-selection and active choice on the part of the designer working with the regular players, many of the roles were extremely well cast. In this case, the state governor and city mayor roles were taken on by people that seemed like they could have legitimately held those jobs in real life (as opposed to twenty-somethings with an abnormally large sense of entitlement), and three key roles at Necrotech were taken up by a trio of players notorious within the Megagame player base as being somewhat shifty and traitorous, who all turned up wearing suits and suitably sinister shades. The game was planned to take place over 6 hours, with each ‘turn’ (in which each team collects information and makes decisions) taking 20 minutes of real time and representing 4 hours of in-game time. In total, 18 turns would represent the first 3 days of the outbreak. I diligently read through all this material, and was only slightly alarmed by the repeated reminders in the newbie guide that it was only a game and some people might come across as surprisingly abrasive while playing, but this isn’t personal and in reality everyone is definitely really friendly. I wasn’t too worried as I’d signed up with a friend (albeit one who hadn’t played a megagame before either), and we chose junior roles in the State Police, a team we anticipated wouldn’t be as critical to the co-operative zombie-fighting effort as most of the others. The instructions also said that although we knew going in that the game was about ‘zombies’, we should try not to use this unnatural precognition in our initial choices in the game, and in particular we shouldn’t make any assumptions about the nature of the infection (if it was an infection) or how it was transmitted (if it was transmitted). I was very happy to do that, because I was really interested in the premise of the game: realistically, how would a zombie invasion play out? Quite obviously, in the initial stages, there would be a big barrier of disbelief. How does that barrier eventually get overcome? I got to Anerley Town Hall at 9am, and relatively few others had arrived. I was welcomed by Jim Wallman, the game’s designer, I bought myself an all-day tea subscription from the service hatch, and started to put some faces to the names I’d already seen on the roles sheet that came with the welcome pack. It wasn’t long before we had our whole State Police team together: myself as Chief of Staff, my friend as the Deputy, and a guy who had played one megagame before as the Chief – a quite significantly inexperienced team. Our table was set up with a state map, a city map, and and an overwhelming stack of counters representing our units. The first few turns played out much as I’ve described in the fictionalised interludes so far. The game then began to switch gear (for us), and it felt like we were receiving new information, discussing plans, writing out orders, liaising, and most exhaustingly making decisions just about constantly after that. Occasionally there would be a brief lull, during which time I could take advantage of my tea subscription. Brilliantly, one of the ways we became aware of developments was through the media – a one-page ‘newspaper’ was distributed every hour, and occasionally press conferences were held in which key figures put out their official story (to some heckling). I remembered that the instructions had warned: “The game can get very complex, try to remember that it’s just as tough for everyone” – and that was a useful idea to cling on to when it started to feel overwhelming. I remember once reading somewhere “the map is not the territory,” which sounded like good general advice, but through my experience of video games where the map really is the territory, I didn’t internalise it. Here, the map only updates when you yourself update it, and you have partial or even incorrect information on how to do that. This was a fascinating problem, made slightly more difficult by the fact that our city map really wasn’t big enough to arrange the counters on it clearly. Once things took hold, it was incredibly hectic – more hectic, Jim later revealed, than he had anticipated. This created its own problems: the Control team had a hard time keeping up, and as a result turns began to start later and later, but with no big public announcement of when they were, so we had to frequently find someone to tell us what turn we were in right now. It seems like turns could be more efficiently communicated – if nothing else with a big flip chart with the current turn number indicated at one end of the hall (and ideally someone ringing a giant gong to announce the end of a turn). Due to the above issues, it felt like the game was at the limit of its scale, but if they could be addressed (and if players could be found) it could get even bigger. In particular, just from the cast list and arrangement of the hall, we knew the game couldn’t really accommodate a major outbreak in another city within the State. But because we were interested in a realistic simulation, we as the State Police considered that a real possibility, and held units in reserve just in case. (That did come in handy later for another reason, but probably wasn’t a good strategic decision). I really liked the idea of introducing a surprise element of the game though – a secret part of the hall we were playing in being revealed to have players and a map representing another city at the moment it starts to get zombied up – or maybe towards the end when/if our containment attempts have failed, a bunch of people in zombie makeup run into the hall and start trashing the place. But that’s probably just me. I had read before about decision fatigue, in which it becomes hard to make decisions if you have recently made a bunch of other (not necessarily related) choices. This aspect of the game was so intense and so prolonged (near-constant decision making for around 6 hours) that I found myself unable to cope with most decisions for the next two days, which was a bit inconvenient, but also, fascinating! If you have an interest in large-scale games, human-based simulations, or a very practical approach to zombies, I would highly recommend taking part. As I mentioned at the start, another run of the game is due to take place in Leeds this Saturday 17th November. You can find out more about other upcoming megagames, or megagames in general, at their site. I didn’t realise this at the time, but James Kemp commented on the progress of the outbreak from his perspective with the emergency services team in real time. So if you want to get an idea of how the outbreak played out, you should check that out! Follow that up with his post-script in which he switched to a Federal role and had a very different set of concerns.